Leveraging insights from genomic studies of patient tumors is limited by the discordance between these tumors and the cell line models used for functional studies. We integrate omics datasets using functional networks to identify gene modules reflecting variation between tumors and show that the structure of these modules can be evaluated in cell lines to discover clinically relevant biomarkers of therapeutic responses. 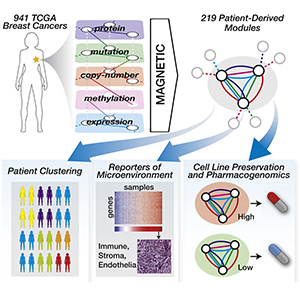 Applied to breast cancer, we identify 219 gene modules that capture recurrent alterations and subtype patients and quantitate various cell types within the tumor microenvironment. Comparison of modules between tumors and cell lines reveals that many modules composed primarily of gene expression and methylation are poorly preserved. In contrast, preserved modules are highly predictive of drug responses in a manner that is robust and clinically relevant. This work addresses a fundamental challenge in pharmacogenomics that can only be overcome by the joint analysis of patient and cell line data.